Who doesn't love a good deal? When I shop, I walk the clearance isles and thrift stores. Sure, occasionally I go big, like my electronics, purses, or work attire, but for my decor I don't. I like the story behind the purchase, or the personality the piece is lacking and I'm about to give it. This may be just because "I live in an apartment mode" and when we actually take the buying plunge we may spring for more costly things? Or not, because I change my mind about decor as much as I change my phone case (which is often just ask Eric). This entire blurb or random chat brings me too my $5 shelves from Target, that I think were 75% off? I could be wrong. I bought 4 boxes of them and divided them between both bathrooms. 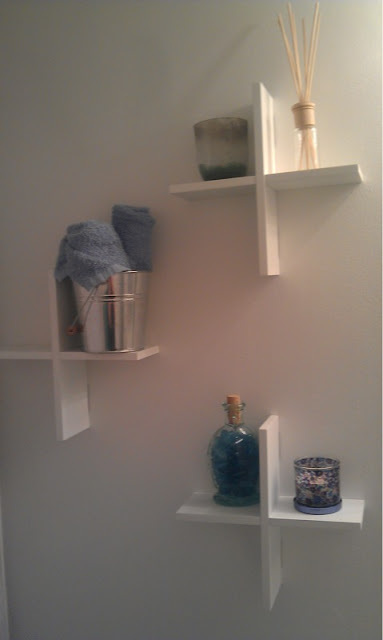 In the "guest" bathroom, here are the shelves across from the toilet. I took some left over flowers from a birthday present I made 2 years ago and but them in a patron tequila bottle. The beige ball was from a pack off 8 from the dollar store, then some extra hand towels. Normally I have some rolls of toilet paper stacked, up as well, but then I got weirded out about doing that (dust, hair, etc). Above the toilet we have the other shelves. Put up a couple of candles, a dollar spot bucket and more hand towels, those oil infused stick things (please comment with correct name), and a fancy glass bottle filled with fancy glass marbles. Apparently it was spring time when I tossed these colors around, but again the point in they were only $5 dollar shelves. Magically right? 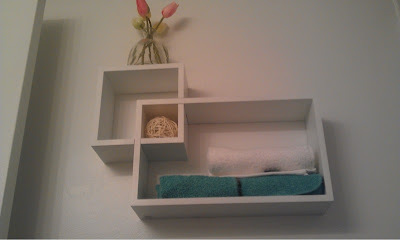 In the other bathroom, the one that is always cluttered, used daily by us, and kept private when company is around. Not my proudest room in the apartment, but it works. 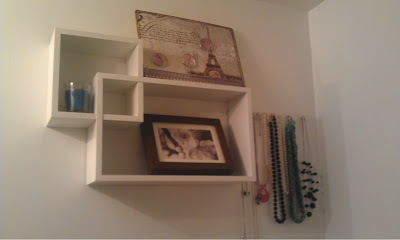 Everything on this wall is rather self explanatory, here nothing special, but my awesome display of necklaces. I had a bunch more but they were all ruined by my other means of storage. I think I was going for French glam in this bathroom? Just a few candles, monuments, and glass bottles. Are you at all shocked about the glass bottles? I truly adore my pink bottles, especially because they were on clearance at Michaels. The bottom one I use for mixed match earrings, barbells, bathing suit top string, and some rings. I could keep the items in a little dish, but then Stella (cat) would make them her latest and greatest toy. 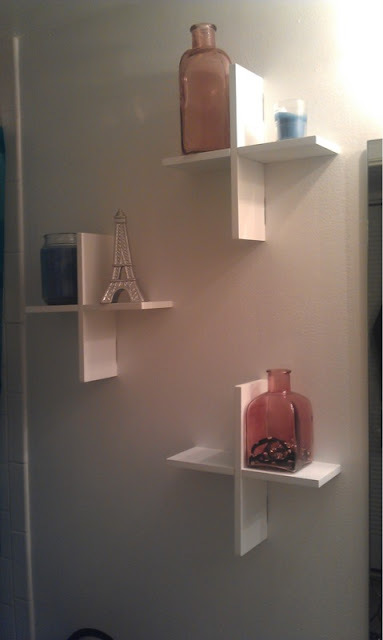 In the new apartment I have plans of painting these, keeping some in the bathroom, some in our bedroom or hallway.